Don’t let any of the boosterism produced by the local media fool you: the North American International Auto Show ain’t what it used to be. Not only have the hometown automakers — Chrysler, Ford, and General Motors — cut back on the number of show cars and Las Vegas-style presentations compared with previous years, but brands that really should show up to get car lovers’ hearts pumping — Aston Martin, Ferrari, Lamborghini, McLaren, Jaguar, Rolls-Royce — continue to be absent from what continues to be billed as an “international” show. Of course, fewer participants means more media attention for the automakers that have new concepts, like Japan’s struggling pair of luxury brands, Toyota’s Lexus and Honda’s Acura. 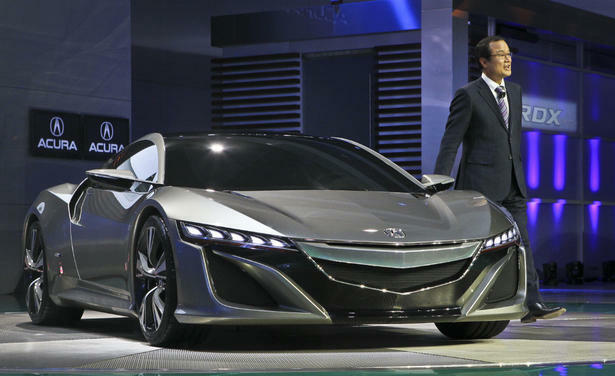 Mainly due to the lack of official information released beforehand, and the cult-like status of its predecessor, the concept for the reincarnation of the Acura NSX super car is arguably the hit of this year’s show. It also represents the tip of a host of new engineering and technologies that will also appear in future Acuras and Hondas. Like the 1990 to 2005 original, the new NSX is a two-door with only two seats, has a V6 engine in the middle of its chassis, and is wrapped in low-slung bodywork, reminiscent of cars from the absent Italian exotic brands. after seeing the one off prototype in the Avenger's upcoming movie, I'm glad the NSX is looking like a proper mid engine car.